Significant amounts of natural energy is stored in the form of salinity in Brine seawater. The natural reverse osmosis benefits the skins health as a great source of nutrients for the skin. Magnesium bath brine, or bath salts, are a form of transdermal magnesium, a method of mineral supplementation designed to deliver magnesium through the skin for rapid absorption into the cells. Use regularly to help prevent dry, tight, and itchy skin, relieve muscle fatigue and soreness. Brine bath provides the salt minerals that help your skin recharge ions with relaxing, purifying and soothing properties for the mind and body. Magnesium - which contributes to slowing down the aging process and which is considered as a natural anti-stress. Soaking in magnesium brine has also been shown to markedly speed wound healing, enhance skin barrier function, and decrease inflammation. 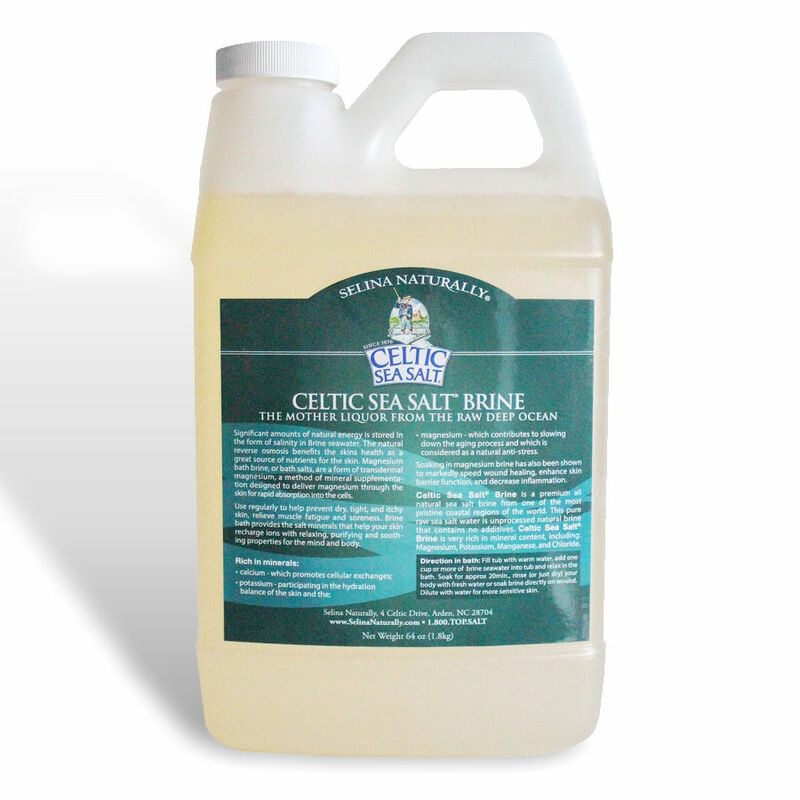 Celtic Sea Salt® Brine is a premium all natural sea salt brine from one of the most pristine coastal regions of the world. This pure raw sea salt water is unprocessed natural brine that contains no additives. Fill tub with warm water, add one cup or more of brine seawater into tub and relax in the bath. Soak for approx 20min., rinse (or just dry) your body with fresh water or soak brine directly on wound. Dilute with water for more sensitive skin.